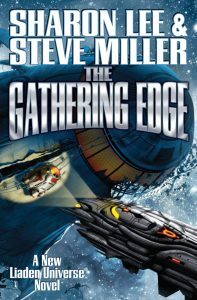 “The Gathering Edge.” By Sharon Lee and Steve Miller. Baen. May 2, 2017. Hardcover. 368 pages. $25. Space opera is Lee and Miller’s specialty, wide-canvas sagas of intergalactic trade and warfare, faster-than-light travel and non-human aliens who look like bipedal turtles. 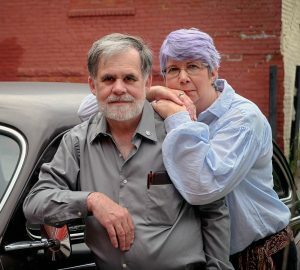 Husband and wife authors Steve Miller and Sharon Lee. Their fictional universe takes its name from the survivors of another universe that collapsed and who now come from the planet Liad. Among the human races – which include Terrans and the super-soldier Yxtrang – Liadens consider themselves the cultural elite. The sprawl of the Liaden Universe allows stories of all sorts, presented in a non-chronological fashion. “The Gathering Edge,” for example, continues the adventures of Theo Waitley as she, her crew and the self-aware starship Bechimo deal with the arrival of flotsam from that previously mentioned collapsing universe. Everything from tea cups to whole spaceships are leaking through, and Theo must decide whether to help the survivors. Some narrative arcs in the Liaden Universe are more accessible to new readers than others, but Lee and Miller take care to provide jumping-on points. An electronic edition of the first Theo Waitley novel, “Fledgling,” is available for free from baen.com or from Amazon. In 2012, Lee and Miller received the Edward E. Smith Memorial Award for Imaginative Fiction, presented by the New England Science Fiction Association. Both Miller and Lee grew up in Baltimore and moved to Skowhegan in 1988. Their Liaden books were anything but an overnight success. “Emotionally, it was a little bit rough when our editor at DelRey told us we didn’t have a career,” Lee said. For a while – somewhere between seven and 10 years, depending on whether you ask Miller or Lee – it looked as if the editor were right. During those lean times, the couple focused on their freelance day jobs. Health care is a continuing concern. Recently, they were able to raise money for Miller’s dental expenses through a crowd-funding site and by providing exclusive material for paying subscribers. The contributions testify to the solidity of their fan base. Indeed, it was online that Lee and Miller found a sense of community. Miller’s early work with computer bulletin boards brought him e-mail from fans who were passing around used copies of the couple’s books and eager for more installments. Booksellers were also hand-selling used copies of their work. Eventually, between 1999 and 2006, Meisha Merlin Publications published 10 Lee and Miller titles. When the company ceased operations, the rights reverted to the authors, and since then, their books have been published by Baen Books. “Other than Stephen King or Tess Gerritsen, generally they don’t have much to do with science fiction or fantasy,” he said. As rocky as the path to literary success has sometimes been, Lee and Miller are now in the enviable position of being able to secure a contract for a new book with little more than the promise that it will be set in the Liaden Universe. They are under contract to write six more books between now and 2023. And that’s how a universe keeps expanding.